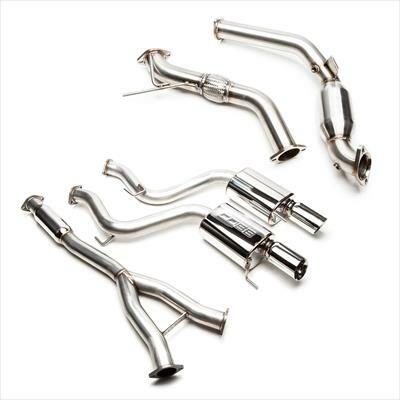 The COBB Turboback Exhaust for the EcoBoost Mustang combines the COBB 3' Downpipe and the COBB Cat-back Exhaust System. The turboback system features full 3' 304 stainless steel construction, a COBB 'C' logo support brace, cast/machined turbo flange, a high quality, 200 cell count, metal spun catalytic converter, COBB stamped mufflers, and two 4' dual-walled tips featuring the COBB logo. The V2 Cat-Back Exhaust features a 3' to dual 2.5' configuration which contributes to a much more subtle tone than the original 3' to dual 3' design.